Motto: "Nobody can escape the rain"
ZeroWolf wrote: You're right it gets +1 for each cargo trailer but that effect is then done again for each cargo trailer. So you play one cargo trailer so it resolves at +1 Attack as its the only one. Then you playa second on the same ability slot,when it resolves, the first cargo trailer now gives you +2 as there are two cargo trailers now in play. The second cargo trailer also gives the character +2 as there are two cargo trailers in play... See how this is working? I see how it's working but I don't understand why it's doing that, the card doesn't say to do that at all. It should be a crime to replace SS Thundercracker's head with another's. But that's what all the cards are saying as they are all active. ZeroWolf wrote: But that's what all the cards are saying as they are all active. 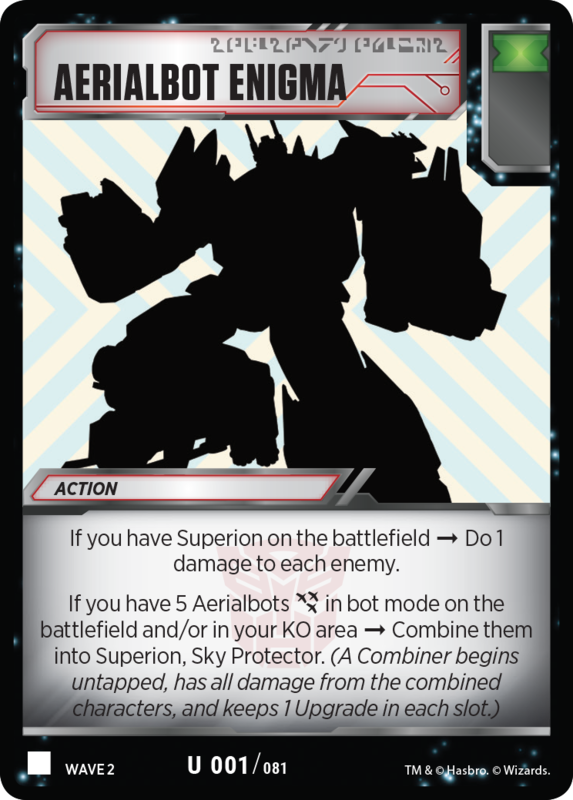 Thanks to Seibertron member, Survivefan23 – we have had our optics directed towards the official Transformers Trading Card Game Facebook page and its reveal of another combiner. This time its the Fiery Champion Volcanicus! Costing a whopping 39 (thats thirty-nine, count 'em) stars, this Melee combiner sports 6 Attack and 56 Health. Volcanicus will be joining the previously revealed Predaking hitting the shelves in the USA on March 1st. Transformers Trading Card Game wrote: What's cooler than five huge robots that turn into dinosaurs? One gigantic robot made out of five robots that turn into dinosaurs. *In the US and other territories. Check with your preferred retailer for availability. **For some insight into how this terrifying team operates, check out Grimlock's ability! Are you stoked for this combiner feast coming your way or do they have you quaking in your boots and reaching for your Windblade Combiner Hunter? Let us know in the discussion right here on Seibertron.com's Energon Pub! Motto: ""Time to Smash now, Time to Talk latter."" I was looking through my Facebook news feed and I saw him and thought, "well since no one has posted anything on him yet, how about I show you my discovery" & that's what I've done. They have the Dinobot Enigma card, its the 2nd post below the one I saw. Just scroll down. Motto: "Wake up. Wake up and smell the ashes." Survivefan23 wrote: I was looking through my Facebook news feed and I saw him and thought, "well since no one has posted anything on him yet, how about I show you my discovery" & that's what I've done. Thanks for dropping this here! "I don't stink, but I am silent but deadly!" ~One of the many reasons I like Sideways. Check out my YouTube for my Transformers Trading Card Game lists, gameplay and general thoughts on the game! Dinobots again? I don't necessarily mind but would rather see more new characters. I have to admit, that's some good looking Volcanicus art. I like the way they made the weird shoulders part of the upper arms and he doesn't need spare hands to bulk his torso. I just realized this means my biggest gripe from wave 1 is handled - all 5 Dinobots can be played at once. Nice! Like the toys, I will never combine them. The other new cards revealed today come couresty of VectorSigma.info and Wreck'n Rule from YouTube. "Whenever Earth settles, God chucks a stone at it. And believe me, he's winding up." W-Wait, is that the--? The Beast!? Wait, what? It's Volcanicus? Oh, thank God. I thought I was going to have an aneurysm. Anyway, the Transformers Trading Card Game group is back at it again with the reveals. This time, they've revealed an entire team of Combiners -- and they're all rare! That, and they teased the reveal of something even further beyond our imagination, with a Battle Card that references a "Sentinel". Let's dive in! "Watch me swooce right in!" But there are plenty of Specialists in the game, and two of them are Dinobots already! So, by now, it should be obvious why this card is good, then. You see, his robot ability has the effect that puts extra Green Cards in your hand. Like all Green Cards, you have to choose who you're going to let in. To your hand, I mean. Unfortunately, you can only choose one Green Pip to put into your hand, and as such, if you happen to have -- for instance -- a Focus Fire and a Dinobot Enigma in your top flips, you can only choose one to put into your hand. The good news is that Swoop can put them both, and without discarding a card to do so. That is a great effect, as the discarding effect generally forces you to discard things you might not want to. Now, when we compare him to his previous iteration from Wave 1, we see that whereas his stats are slightly better in some regards, he's also one more star in order to play, which kind of defeats the purpose of playing Swoop in your Dinobot list. Let's be clear, here -- playing Swoop in a Dinobot list is really only viable when you're trying to cut points in order to play a Mounted Missiles Upgrade or something similar to put those nice pips in the deck. Since this guy is a 7-Star and not a 6-Star, I can't really recommend playing him outside of the Volcanicus list. All in all, I don't think that he'll ever replace his previous iteration -- but I do think that the Volcanicus lists that can play him, probably should if for no other reason than his Specialist support. Always the bridesmaid, never the bride. This version of Slug isn't as full of cesium salami that his previous iteration was, but let's be fair here, this version isn't that great either. Looking at the stats alone, we have a large point count with rather mediocre stats. I mean, he has great defensive abilities, for sure, but when you have a low attack along with it, you aren't going to be dealing a lot of damage at all. But, there is a silver lining. His robot mode ability does give you a "soft" Bold effect when you flip a White pip, which can add to his damage moreso than not having that ability, but let's face it, he's a Dinobot, and that one extra card that you're going to see off the White pip isn't going to do much. It is nice, though, to combine it with your high Bold numbers that you're sure to run in a Volcanicus deck. But what about outside of a Volcanicus deck? Well, in short, being 8 Stars could make him interesting to play instead of Sludge, but Sludge is so good at keeping your Grimlock and Snarl alive that you're kinda crazy not to play him. Sludge is just that good -- he's even a Specialist! -- so it's not that Slug is an overtly bad card, it's just that there are so many better options that it's not worth it to try and fit him in a list. I mean, you could try making a list without Grimlock, but at that point, why are you even playing Dinobots in the first place? Hey, what'ya know, it's the draw power of this archetype! In all seriousness, however, you can definitely tell that this card is "get out of jail free" card that you use after using a Dino-Chomp. Out of all the newly revealed Dinobots, this one synergizes the best with a Dino-Chomp. See, whereas your stats are low like all Combiner bits, you have that draw ability which gives you a way out of your potential "dead draw" mode after discarding your hand with a Dino-Chomp, all the while dumping raw power into your attack to deal much-needed early damage before you combine. You see, the combination game can be volatile. Once you combine and you don't win by a decisive margin, to be perfectly frank, you're probably going to end up losing. You need to defeat several characters on your opponent's field (depending on what they're playing, of course) before you combine, unless you want them to gang up on your combiner. This is accentuated with the low defense of The Bea-- Er, Volcanicus' combined form. I think that playing Dino-Chomp is the only way you're going to get that value in the early game, and who better to use it than a guy that draws you two cards when you do? So, what about Sludge outside of the Volcanicus list? Well, I doubt you'll find too much use out of him. Wave 1 Snarl is just better value in terms of both offensive power and draw power, and Sludge is 8 stars to Snarl's 7, so there is very little reason to take him over Snarl. Sadly, the only home he has is in Volcanicus -- and Volcanicus is all-too happy to have him. Well, hit or miss, I guess you never miss, huh? This Snarl is straight up better than the previous Snarl. Why, you ask? Why do I think that this folded potato chip is better than the best Dino in Dinobots? Well, let's make like Lucio and break it down. Okay, so this Snarl has one less attack than the Wave 1 Snarl in both modes, and lacks the draw ability that the previous Snarl had, but when you look at the draw power that he had before, you begin to realize that you are seldom going to be at zero cards in hand, especially with a Data Bank in play. Beyond that, Snarl from Wave 1 had essentially Plan 1 without the keyword -- and this Snarl has twice that, with Plan 2. Early game, you're making more use of the less useful cards in your hand with his Planning effect, and making the most out of the cards in your hand before a Dino-Chomp makes me happy. The other Snarl almost discorded with Dino-Chomp in a few ways, being that his Dinosaur mode was the only thing that you can use to draw with, and that you're generally going to want to invest a Dino-Chomp in a higher attack target like Grimlock, it meant that most of the time you were Transforming and attacking with Grimlock instead of having the time to set up a Snarl draw play. So, for that reason, I like this Snarl better than the previous one. You just make more use out of him early on than the other Snarl, and in this fast-paced game, you really need early value, and that goes for both Volcanicus and standard. "And I shall call him... 'Mini-Me'." This tiny version of Grimlock is one of the most fascinating cards I have ever seen. First off, you might have noticed something. All of these Dinobots can combine into Volcanicus, and despite that, you can't play all five Dinobots on the same team. How is this possible, you ask? Well, look no further than Grimlock -- Powerful Commander. You see, Combiners don't really care whether or not you've been killing all of their friends. Just so long as they're in robot mode, you can combine all the same. Sure, you're still going to have the damage carry over, but you're combining all the same. So, when you use Grimlock's ability to put some Dinobots outside the game -- i.e. His missing teammates -- you get to combine, albeit damaged, without having to play all five Dinobots in the same list. 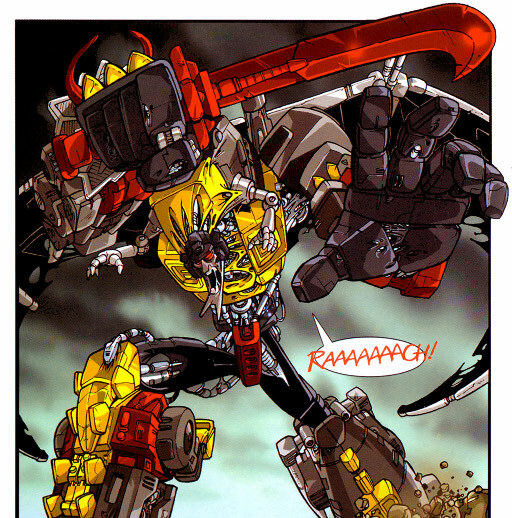 That makes this Grimlock not only the most important character in the list, but also one of the most powerful. Looking at his stats, you have a considerable HP stat and some of the most powerful attack stats of his brethren, being tied with Snarl at 4. Of course, his defense is actually the worst out of his teammates, but, uh, we don't talk about that. Of course, that means you probably won't get too much longevity out of him, but that's what I STILL FUNCTION! is for, right? Speaking of, I would like to point out that it says "Dinobot" not a specific Dinobot card. Meaning, you can put one of the Wave 1 Dinobots in your KO zone, which brings up some fascinating -- and in some cases, absolutely absurd combos. For instance, you can put Grimlock into the KO zone and I STILL FUNCTION! him into play for some potentially game-winning Trample plays with his effects. Of course, there is an even more absurd and -- dare I say broken? -- combo that you can pull off, but more on that later. You can also put this guy into non-Volcanicus lists. You can deal small amount of damage in terms of his bigger brethren, but you can put some cool I STILL FUNCTION targets into the KO Pile to mess around with which makes that deck archetype even more interesting than it already is. 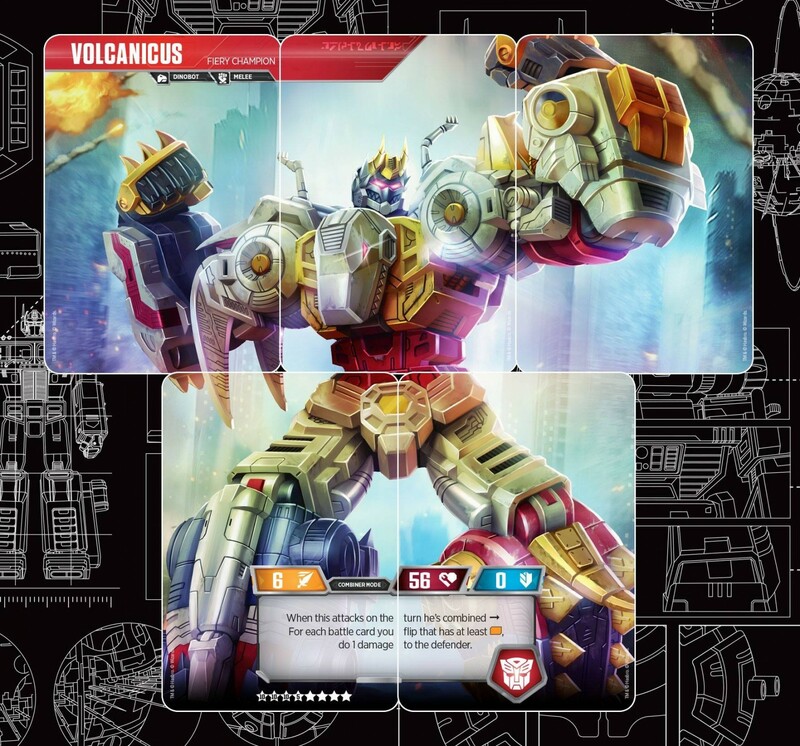 But perhaps another interesting way to play him is to play him without any of his Volcanicus friends, and play a standard Dinobot list that, with his effect putting his Volcanicus friends into the KO zone, you can potentially combine with your other Dinobots on the field. Unlikely, for sure, as it requires attacking with him four times in a row at least, but still an interesting thought. So in closing, I'll leave you with two questions: One, what I STILL FUNCTION! combos can you think of? And two, why the heck does he have an Autobot logo on his, uh... Codpiece? "I think a lot about meteors. The purity of them. BOOM! The end. Start again. A world made clean for a new man to rebuild." This combiner is super nutty, and I like him way better than Predaking at least thus far. Predaking is probably a "baseline" combiner, with very little special happening with him (in terms of combiners, that is). Volcanicus, however, is the antithesis of that, with the most interesting way to combine. But here's the thing: They all have the same end result. Predaking has a strategy that essentially follows the rhythm of "transform, attack, die" until you eventually combine into Predaking to take your last KO or two. Thing is, Volcanicus takes that and dials it up to 11. See, when you combine, your orange Battle Cards are all essentially treated as double, with each orange card you flip dealing extra damage indirectly to your quarry. You can do so much damage with that single attack that I'm not sure anything can survive it. Volcanicus also has access to the staggering support of Dinobots, being a Dinobot himself. You can use Dino-Chomp! and Jaws of Steel -- heck, you can use I STILL FUNCTION! to return a Grimlock -- Dinobot Leader to the field and Transform him, giving you more Bold! Obviously that's probably a bad idea, but you get what I'm saying here. You can pull off some absurd numbers if you happen to have a card that allows you to play multiple Actions in a turn. Here's the thing, though: Volcanicus has zero defense, and all damage from your composite parts remain on the finished product. That means your monstrous 56 HP isn't going to last too long when you're probably already sitting at 40 Damage when you combine. Remember, at least two of your characters are going to be KO'd when you combine thanks to Grimlock's effect, and that's not counting the potential one to two other characters that will be joining them before you get a chance to combine. So, the end result is that you're going to be at a very high damage when you combine, and with zero defense, you're probably going to end up taking one KO anyway before you get a retaliatory KO, whether a Force Field is there being a big player in his survivability. But there is a remedy for that problem, and it relies on Baby Grimlock (i.e. Volcanicus Grimlock) bringing in someone pretty special: Sludge from Wave 1. How Sludge's healing works is that when you Transform him to Dino mode, you can move as much damage from your Dinobots as you want to him -- even if you go over his 12 HP. So, that being said, you can end up using an I STILL FUNCTION! to return him to play, and Transform him while he's in play to move all of the damage from Volcanicus to Sludge and completely heal off all 56 HP on that behemoth. That's freaking insane, and it means that your opponent is probably going to scoop to you when that happens because there is no way they're going to be able to chew through 56 freaking HP. To put it in perspective, Metroplex has 36 HP. To say that Sludge healing off this guy is absurd if you can pull it off is a bit of an understatement. Granted, pulling off that combo is unlikely, especially if the board state doesn't allow you to have that kind of leeway. In some cases, it's just better to bring out a Big Grimlock and hit somebody with him like a beatstick, just to avoid all of your opponent's characters from ganging up on Volcanicus. But to be frank, if you haven't killed something by the time you combine, you've probably lost anyway. I could go on talking about this guy for ages, with so many different ways you can play him, but I think I should boil down my thoughts so you don't die of old age before I get to the point: Volcanicus is very good, and Baby Dinobots should not be underestimated. You deal a lot of damage early game with these Dinobots, and when you combine into Volcanicus, you are almost gifted a free KO with how much damage he can do. He's the definition of a glass cannon, so you're probably going to end up combining to take your last KO or two, but with spicy effects like Sludge, you can potentially combine and remain on the field almost indefinitely. All in all? I'm terrified of this mad lad. This absolute unit has unbelievable potential in the metagame and I can't wait to see where he goes from here. "Life... Uh, finds a way." There isn't too much to write home about when it comes to Enigmas. I mean, they do what you expect them to do -- like Spirit Links from Pokemon, they allow certain larger strategies to be played effectively, and the Dinobot Enigma is no different. But one thing I love about these Enigma is that even after you've combined with them, that they still serve a purpose after you're done using them. Predacon Enigma allows them to attach another Upgrade, essentially a Green-pipped New Designs which is welcome in my book. This, however, is a slightly worse Supercharge, which makes me a little less excited. You see, when you live in the world of Dino-Chomp!, Supercharge and Focus Fire, Bold 2 just seems too small on an Action Card! But it's not like you're playing this card for this secondary effect -- playing three Enigma in almost all circumstances we've seen at the time of writing is a big mistake, as they will just end up cluttering your hand and flips too much near the end of the game. We're at the point where we see something fascinating in terms of list building: A one-of. Unlike Pokemon, there are no Prize Cards in this game that pull cards out of your list and put them in an unreachable state. There are no cards that disrupt Green Cards that we know of, so a one-of simply makes sense. I mean, you are a deck that still stacks Bold, here -- you get to mill your deck so easily that you're bound to find the Enigma when you need it. Of course, that's just a theory -- things could be different in practice, but again, theorycrafting is my job here. All in all, it's just kind of... An Enigma card. I don't really expect anything out of these cards, so when I get something, I'm always glad. This card is like me at parties -- just kind of... There, you know? This next card is coming straight out of VectorSigma.info with a great dive-in on the card from Scott Landis. He puts some good effort into his math for this card. We don't agree on this card's playability in certain regards, but if you have the time you should definitely check his article out as well as he has some good points he brings up. Anyway, despite having arguably the coolest artwork out of all Star cards, I would probably wager that this card is the worst Star card of the bunch. You might look at the pips and say, "Boy howdy, this is the maddest lad of the bunch! Another orange/blue split!" and I would agree that it's always nice to see color combos in this game, but let me ask you, when you read this card, does it seem good? You might say "yes", and that's fine. But look again. Doesn't this seem, I dunno, familiar? Look at it a third time. You're flipping an extra card on your attack and on your defense... Sounds like Bold and Tough, dunnit? I have a very strong opinion on this card in particular, but for the sake of this article's length I won't bore you with the details. Well, most of them, anyway. So let's look at this in terms of what it's meant to do. When you attack, you flip your three cards and you find that one of them is, in fact, not the color you were looking for. You scrap it, and you wind up with an optimal flip. Then, on your defense, you do the same, right? Well, that's not exactly the case. You see, in this fast-paced game, the general gist is you should typically keep to a mono-color deck -- either orange or blue -- with very few decks playing the mix well or effectively. Metroplex gets away with it, but only barely, and he can't use this card thanks to his massive point pool. Put it this way, when you attack, sure, you're going to make use of that Bold effect. But when you defend, you're flipping an extra card that could have been drawn or flipped later. In defensive lists, you're milling more cards than you need to on the attack flips. It's like attaching a Power Sword in a blue list -- not very helpful unless you're digging with Battlefield Legend Optimus Prime, right? That's what this card does in mono-color decks. It's really not that great in them, and honestly, I would rather just attach a Weapon or an Armor in a balanced list. This meta is very fast-paced, so when you spend a turn attaching something that is essentially a combo of Bold 1 and Tough 1, it's just a "feels bad" moment like attaching a Data Bank, but unlike Data Bank, you aren't seeing that much return on your investment in the long run. It's just better in your deck to flip, and in that case, wouldn't you just rather play a Mounted Missiles to flip and give yourself +2? Or even attach it to also give yourself +2? There are so many better Star Cards that I can't in good conscience recommend playing this card unless you have a very specific list in mind, and even then. Cool artwork, good pips, bad card. Simple as that. But hey, they can't all be winners, right? Okay, okay, why is Optimus crossing the Delaware!? This card is brought to us by Wreck N' Rule, another YouTuber-in-arms of mine who also produces TFTCG content. If you'd like to check out their channel and their thoughts on this card, check their video out with that link! There has been so much discussion around this card that it's actually a little startling. So many people have so many different ideas -- it's tough to keep track of them all. There are so many implications for this card alone that made people lose their minds for a 12-hour period. Basically, the gist of it is, first off, that you put it on "Sentinels only" which is baffling since we have no idea what a "Sentinel" is or what that would be. This brought up several instances of lore digging, with several bringing up that Omega Supreme was part of the Omega Sentinels, who could be described as "Sentinels" in the card game. Something that discounts this is the artwork, which has Victorion in the background. This might bring forth the idea that the Torchbearers could be renamed into the Sentinels, but that's the only evidence one way or the other in that regard. Another thing that brought up massive discussion was the fact that it mentioned flipping your robots in the KO pile to Robot, then back to vehicle. This could imply that effects when characters Transform in the KO pile still take into effect, like Battlefield Legend's Action recycling ability. Or perhaps it's a simple effect for these enigmatic "Sentinels" we keep hearing about. Either way, if it's for combination, that simply won't do much for the archetype unless someone's ability is actually broken. Remember, transforming into robot mode is the optimal end result. All in all, I can't pass judgement on this card because its mere existence brings up more questions than concrete answers. It's interesting, that's for certain! But other than that, I can't say one way or another. It's fascinating, and I find myself agreeing with George R. R. Martin when he remarked, "The question is usually more exciting than the answer." Be careful not to build yourself up, for you may be preparing yourself for a fall of disappointment. TFTCG Wave 2, Rise of the Combiners keeps getting more and more interesting. Whereas I don't think Predaking will make it into the metagame without better support, I do think that Volcanicus will take the meta by storm. I firmly believe that -- without playtesting, mind you -- that Volcanicus has massive potential to be a mainstay and a real contender for the top decks. We have more questions than answers, though, in terms of Combiner support, and whether certain interactions with the KO pile make them better or not remains to be seen. Heck, certain KO Pile interactions still remain to be seen for that matter. So, what do you think? Will Volcanicus take over the metagame? Will he be a niche deck that will be straight to the bargain bin? What are Sentinels? Let me know what you think in the comments below, and stay tuned for my next breakdown of the next Transformers TCG reveals, and be sure to check out MY CHANNEL for deck profiles and competitive discussion. Thanks for reading! What do you think about these new cards? Will you be playing them? Let us know in the Energon Pub and stay tuned to Seibertron for all the latest news and reviews! What's that rumbling I hear? 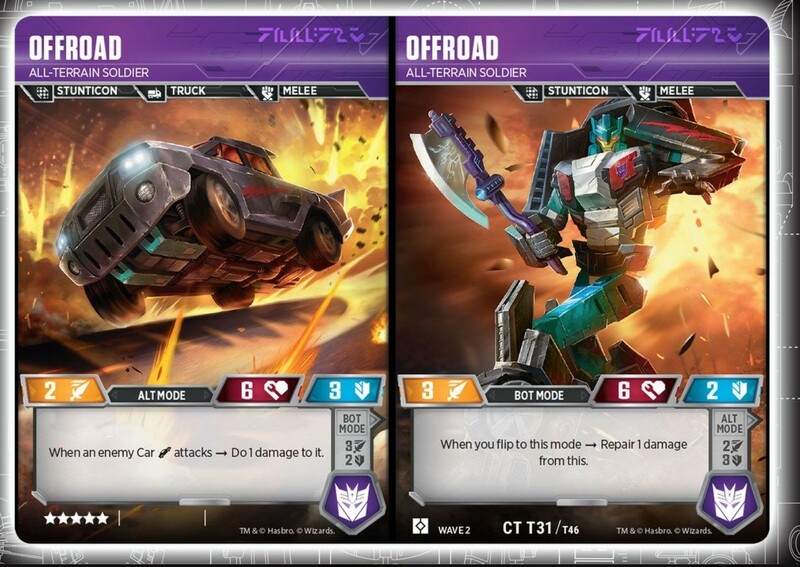 Why it's the sound of another Combiner rushing to the fight in Wizards of the Coast's Official Transformers Trading Card Game! Thanks to fellow Seibertron users, Survivefan23 and #Sideways#, we have scans and card details (and an in-depth analysis of the new cards) to share! 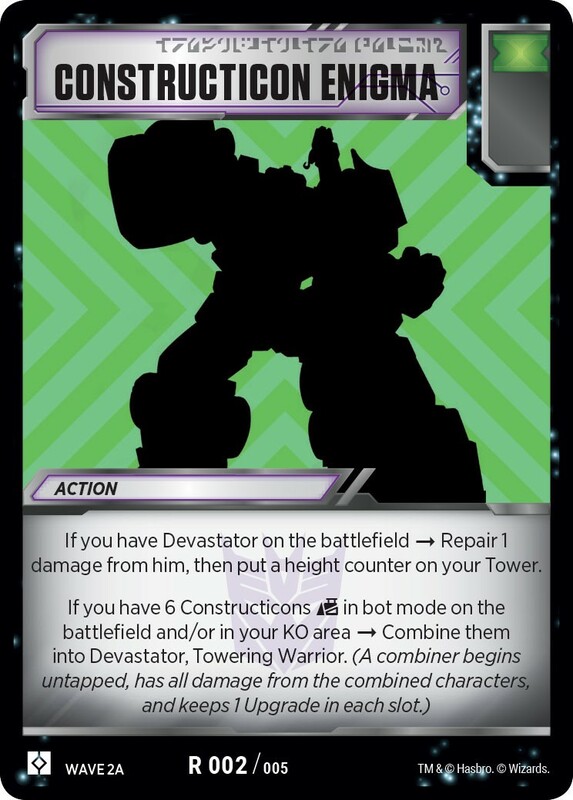 The reveals come from the Official Transformers Trading Card Game Facebook page and Vectorsigma.info. 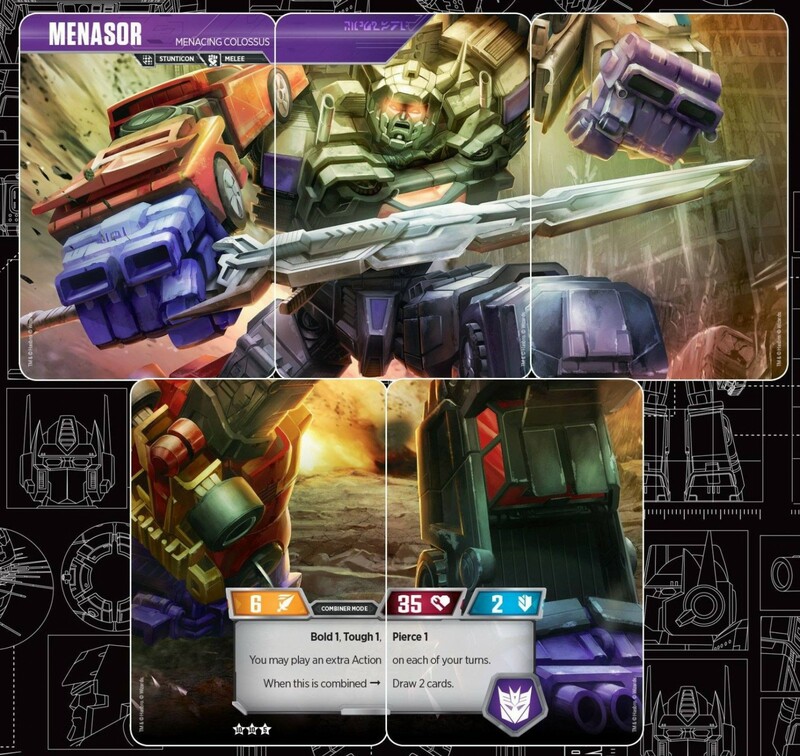 The Transformers Trading Card Game Facebook page is back at it again with these reveals, with card scans courtesy of VectorSigma.info and this time, we have Menasor! But that's not all, Menasor doesn't come alone -- he comes with all his composite parts, and more! But don't just take my word for it, let's take a look! Whoa! Yeah! Kickstart my Spark; hope it never stops! Motormaster is the leader of the group, and he's arguably the most interesting of the bunch. He has painfully average stats when it comes to combiners, especially when you consider Motormaster is a rather powerful brute in canon, but his stats are definitely not what makes him special. He has a very special ability in his Truck mode that keeps your entire team safe from indirect damage, from -- at least insofar as the wording of the card -- pretty much everything. Character Card, Action Cards, Upgrades, nothing can touch your team. Sadly, the only thing he can't protect is himself, as he states "other characters" instead of "all characters". This means that your opponents can target him with Plasma Burst, One Shall Stand and other indirect damage to try to remove him from the field if you're facing something spread-based. Of course, that's fairly uncommon, with Planes and Double Prime being the only things that can effectively pull it off consistently. A lot of other decks seem to dead draw a lot with them, or worse. Although, as a side-note, Insecticon decks that play Barrage do play a bit of indirect damage in them to trigger his robot ability, which could be enough reason to play Motormaster in itself, but that's just pure conjecture. But that is only in terms of his splashability in other lists, or perhaps in the mirror-match. What makes him great for his archetype is his robot mode ability, which can redirect not the damage, but the entire attack to another one of your characters so that they can take the attack instead. Now, generally, it might be for the best if you just let Motormaster just take the hit, but in some cases, when you have a high defense partner for him on your team, you can definitely allow them to be the fall guy. It's worth noting that in his Truck form, he is not technically Melee, Ranged or Specialist -- he's just... There. Whereas this shouldn't be a deal-breaker, it should go into your play as you wouldn't want to accidentally play a Power Sword when you couldn't. All in all, his stats might not be the best, but his utility -- albeit meta dependent -- is great at keeping your team alive. 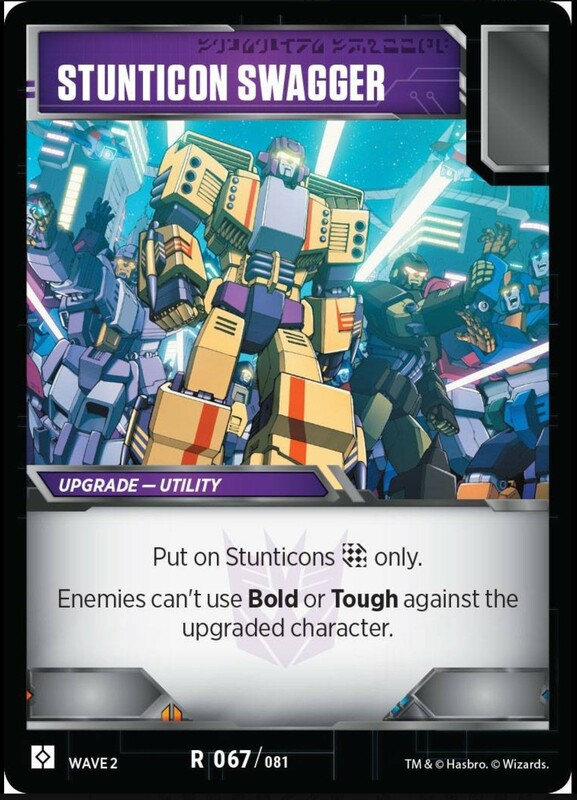 Several decks will find him to be a high-priority target, which in Stunticon decks you'll find it easy to redirect that damage to one of your pawns. But who could possibly fit that "fall-guy" bill? This whole character-swapping thing is a real... Wild-ride. Eh? Ehhh? But in all seriousness, Off-Road has the highest defense out of all the ne'er-do-wells and that makes him all right in my book. Whereas he also has the lowest HP out of the whole group while also being tied for the lowest attack in vehicle mode, something you can easily pull off with him is the ol' switcheroo. With Motormaster attacking first, you can swing for more damage with him and still have the high defense that Off-Road can supply. Ability-wise, he has a fascinating kit that makes him another anti-meta pick. Whereas his robot mode leaves a bit to be desired, his vehicle mode is as anti-Car as I've seen in this game, directly dealing damage specifically to them, damaging them through their "extra attack" playstyle. Of course, this is one thing that makes him annoying in the mirror, as he deals damage indirectly to Car lists, something that Stunticons have in spades. 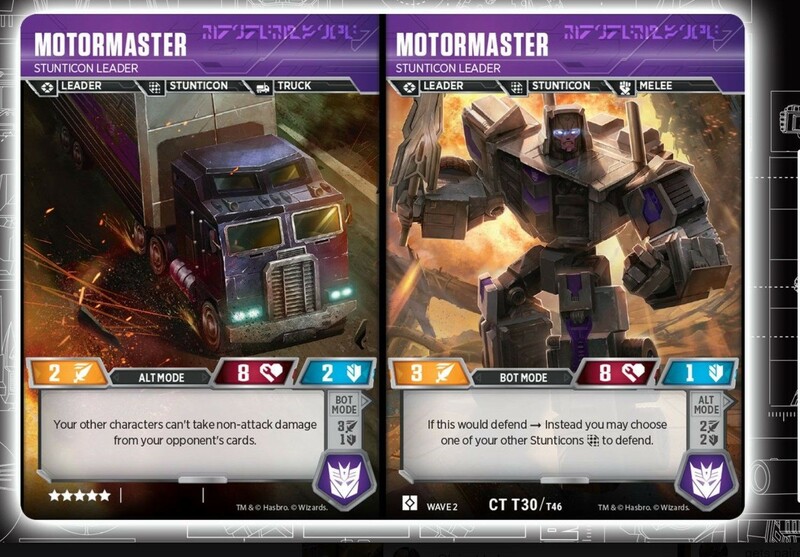 But the thing is, that's also what makes Motormaster so important to keep alive in the mirror, as his ability and his ability alone keeps Off-Road and other oppressive anti-Combiner spread cards from dealing too much damage to your field. Off-Road's robot form isn't nearly as impressive as his vehicle form, as it heals one damage from you when you Transform to robot mode. But, that being said, there is a time and place for that ability. You see, when you have as high of a defensive stat as Off-Road does, you're probably not going to get one-hit, especially with a Reinforced Plating on his person. That's what makes him impressive in terms of survivability. Being a Truck, and in a list that plays Cars, you can abuse Team-Up Tactics to its fullest extent. Well, not exactly. See, whereas Motormaster, Off-Road and all his other compatriots expand their palate of exotic spices with flavors of keywords and interesting abilities, Breakdown is something approaching British food. Not overtly bland per se, but he comes really, really close. He's a lot like Divebomb in that he's a Specialist with low stats and a vanilla form. The good news is, like Divebomb, he's just as useful as a Specialist in the list. Field Communicator remains a very good card in Combiner lists, same with Multi-Mission Gear, and anyone that can use those cards are automatically boosted in my book. But the problem is, he just has no incentive to Transform into robot mode at any time other than last in line, likely in the KO pile. I can't help but think that it was from design that all the power was in his vehicle mode, boasting an impressive ability that can turn an extremely dismal offensive flip that has two blue pips in it into a considerable offensive. Of course, this is one of only a few decks out there that can and will need to play a balanced pip number to supplement this ability and Drag Strip's, which will be discussed below. In more ways than one, Breakdown adores all the Car support that you can play in Stunticons as he can bolster his own offensive abilities while still keeping in his car form. He thrives off balanced lists, as flipping both blue and orange make him deal damage that can't be ignored by most decks of the trade. He's not very splashable in pretty much any list whatsoever, but he's great in Stunticons. On his way to kidnap Penelope Pitstop. Again. Remember when I said that this list thrives on balanced pips? Drag Strip aims to please in that regard, as he boasts some powerful draw in regards to his vehicle mode. His stats are also some of the highest in regards to attack amongst his peers, making him a powerful attacker for the deck in his robot mode. Naturally, "powerful" is relative when he has 4 Attack compared to titans like Optimus Prime or Inferno's 8, but that's neither here nor there. The real power that Drag Strip has is in his draw. He's another great attacker in his vehicle mode, like Breakdown, because of that potentially massive draw that you can have for more or less free. You're going to have a large hand quite quickly with this deck, and that's accentuated by Dead End, as well, but we're going to get to him. Sadly, his robot form still is the weakest part to his kit despite it having the highest base attack of his teammates. Pierce 1 is low, and whereas Pierce stacks with -- potentially -- Scoundrel's Blaster, it's worthy of note that his virtually nonexistent defensive capabilities make him extremely unlikely to survive getting hit, so one might have to think twice about giving him a weapon that isn't a Grenade Launcher. I mean, if it's going to get discarded anyway when he gets KO'd, why not just attach something that gives you more bang for your buck, right? As for his splashability in other lists, I think he could definitely get a place in a Cliffjumper list. Cheap, disposable cars is what Cliffjumper thrives on, and when you're a five star Car that draw cards that can be used to boost Cliffjumper's damage? That's just too hard to pass up. Cliffjumper is a very uncommon deck to face, though, so Drag Strip might not find too much use outside of Cliff and Stunticons, but his draw effect is utterly nutty. Heck, I even want to try him in Sunstorm to give a draw boost, but that's an article for another time. "Doomed Loner"? Big mood. Big. Mood. If you thought that Drag Strip was the best car for Cliffjumper, let me introduce you to Dead End. This guy is a depressed nihilist, but his draw ability only fills me with bubbly optimism. The guy has an easily accessible draw power that combos well with Drag Strip's draw, potentially netting you three cards on top of the cards you're already drawing with Actions, for turn and all the like. He's such a good Transform target on the first turn, and to make sure you get the draw effect off, he has Tough 1 in his car mode. Whereas this won't save you in the long run, especially given the higher damaging counterparts we've seen especially out of the Volcanicus variety, it will at least save you turn one and that's really all that matters when we're talking about this doomed fellow. Dead End is great at getting you into that card-advantage state so treasured by many decks by combining him with Drag Strip. Outside of that, he's not the greatest. Despite that, another deck that loves him is Cliffjumper, who already draws a card when you transform your Cars to robot mode. Using him, you draw two cards when you transform Dead End into robot form. Not bad if I do say so myself. 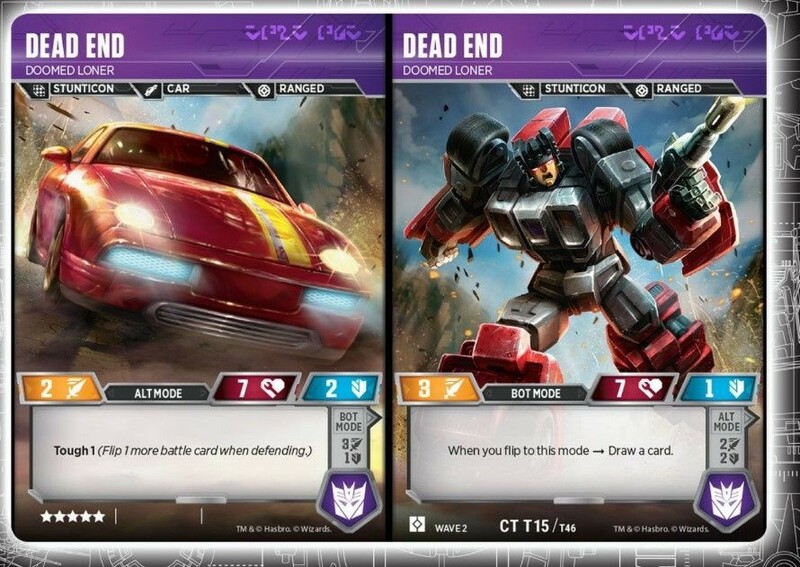 Like Drag Strip, Dead End will see limited use outside of Stunitcons, perhaps even less than Drag Strip in general. Despite my high praise of his draw effect's ease of use, his stats are about as dismal as his personality. Sadly, the only effect to play him is his draw effect -- you can sack him with Motormaster after that. More used cars than Uncle Bobby B's. Menasor is a big chungus. He's not as big as Volcanicus by far -- not even close -- but he's comparable to Metroplex in many ways. In fact, he's only slightly beefier than Metroplex insofar as having one more defense than him. But his abilities aren't just radically different than the metrotitan, but in a way, better than him. Here's the thing: Playing extra Actions on your turn is really insane. Much better than playing multiple Upgrades, especially when some Action cards can literally resurrect the dead, you can pull off some really cool combos with multiple Action effects. You can, for instance, play a Supercharge, then a Reckless Charge to deal frankly disgusting damage, or multiple disruption cards like Disruptive Entrance. I'm honestly fascinated by the prospects of playing multiple Actions in a turn without needing to play Brainstorm first, and I can't wait to find out what kind of broken combo you can do with that ability alone. That double Action ability, combined with the fact that you draw two cards when you combine make Menasor's disruptive abilities potentially extremely powerful. Especially when you consider that you have been drawing extra cards with Dead End and Drag Strip, your hand will likely be Optimal at this point to allow some interesting plays. Of course, that's not where it ends with this absolute unit. The immense thickness of Menasor's neck allows him to have Bold 1, Tough 1 and Pierce 1 all stacked on the same character. Whereas we care extremely little about Pierce 1 when you have a base attack of 6 and the potential to stack some heavily damaging Action cards, we do care about Bold 1 and Tough 1 stacking with our Power Sword and Body Armor already, giving him potentially Bold and Tough 4. With that amount of Tough on him, and hopefully enough remaining HP to give you some leeway, you can probably pull off some pretty long stands as Menasor while giving your opponent disruption of the likes they've never seen before. I must go! My people need me! Escape Route is an intriguing Common Battle Card that's coming out of Wave 2, and I can't help but to wonder to what extent it'll be played if at all. There are certainly niche uses for it, for instance Dinobots might like the idea of digging for it with their massive Bold numbers to pull off some Grimlock flips on himself or perhaps some speedy Sludge plays. But you know someone who would love this card way more than anyone else? Metroplex. Metroplex's playstyle requires you to play maximum copies of anything to net you multiple transformations in one turn. Roll Out, Rapid Conversion, they're all there -- but the problem was, if you whiffed them turn one you're pretty much at a massive disadvantage for the rest of the game given the fast-paced environment of Wave 1. That's where Escape Route comes in. You see, not only do you get to dig for it with Metroplex's inherently high Bold numbers, you also get to make your turn one double flip that much more consistent by playing a third transformation card. I couldn't be more ecstatic -- Metroplex is a low-key favorite of mine. Something about playing with a card the size of an iPad makes me swoon, I guess. But this card has limited use outside of Metroplex and Dinobots. Although, we haven't seen everything this set has to offer, so I can't exactly pass final judgement on it right yet, but it has enough potential to be a great card in certain niche scenarios. Most of the time you're going to want to transform into robot mode, but you never know what else this set has to offer to make this even better. "Mr. 'E'. Mystery. A mystery can also be called an enigma. Enigma. E. Nygma. Edward Nygma. The Riddler!" An Enigma card is an Enigma card. Most of them are kinda useless in many circumstances outside of combination, as I have noticed. This one doesn't do too much that's special unlike the Predaking Enigma that drew a card and then played an Upgrade. The Stunticon Enigma draws two cards instead, which is cool, but I don't really think that makes it worth over-emphasizing on, especially since early game the card is a dead card in your hand. Only when you combine does the effect of having the card in your deck really begin to shine, and that's a shame. But that being said, it's the most important card in the deck as if you don't Combine, you usually end up losing the game with your low offensive and defensive composite stats. All in all, I'll give it a solid score of: Enigma/10. It's an Enigma -- it already merges five or six of your dudes into a bigger dude! What, you want it to do more than that? They see me rollin' / They hatin'. Stunticon Swagger is so freaking good. Okay, I know, it doesn't have a pip and that makes it kinda "meh" to put in your deck, but when you have an effect that's pretty much a pocket Acid Storm, you're going to get your value back multitudes of times over. So, let me give you the lowdown on this card. When it says, "your opponent can't use Bold or Tough against the upgraded character" they mean it literally. You can't use Bold in an attack against the Stunticon that you're attacking, and conversely, you can't use Tough against the Upgraded Stunitcon, either. This card makes Dinobots cry even more than they do now that Acid Storm is being slid into certain decks to counter them. Even Insecticons hate this card, especially since Barrage is taken purely for his own Bold stacking ability. Here's the thing, though. Menasor is also a Stunticon, if you couldn't already tell. That means that his huge self can swagger like the rest of his composite parts, and that means he's just that much harder to take down. His massive defensive abilities have a perfect capstone with Stunticon Swagger, forcing your opponent to rely on boosting their attack stats instead of relying on Bold to do their dirty work for them. It's worth noting that this card is also great against Nemesis Prime decks that rely on Bold and Tough to mill their decks faster. Whereas it probably won't really help as much as attaching a weapon would in the early game, it's certainly a great card to have attached to your Stunticons and it takes the cake in terms of my favorite support for a Combiner as of yet. It's just that good. Pip or not, this card makes me impossibly intrigued to see if Menasor can be as big and powerful as I think he can be. "Careful. A cornered beast is where they're at their most dangerous." As the developers described it, "Cornered!" is an anti-Combiner card. Being able to flip one of your opponent's hard-earned transformations back to their vehicle mode over and over can reduce even the most hardened Combiner player to tears as their entire deck seems to slow down to a crawl. But that's not all, you can also use it to trigger certain effects on your opponent's characters prematurely. As per their weekly "Rules Roundup" that the guys over at Wizards of the Coast are doing, they recently answered a bunch of questions over a variety of topics. One of such questions was whether or not a flip ability triggered on your turn when you used Cornered! on one of your opponent's characters. That answer was an unequivocal "yes", which opens up a new can of worms in terms of potential play strategies to mess up your opponent's life. You see, you can force them to flip when they don't want to. For instance, Nemesis Prime when they are about to reshuffle their deck, or perhaps Skrapnel where you can punish his low HP without his annoying robot mode ability. But more than that, you can abuse cards like Chop Shop too soon, discarding all their hard-earned Upgrades and avoiding the massive draw and healing-fest that was about to happen. There are countless levels of interplay that have come out of this new ruling, and it's definitely something to keep an eye on especially with a potential combiner meta. This brings up an interesting point, though: Why would they counter something so quickly upon release? Combiners already have quite a few problems with speed, especially against aggro decks like Insecticons -- so why make things even more complicated for them? It's unfortunate, really, but it begs the question if we're going to see even more support for them in the future that the developers thought it a good idea to nerf them before release. Either way, I think that this card is really great, if you couldn't tell. It memes hard on Combiners, despite only being able to target living members instead of the ones in the KO pile. It doesn't seem to be all that useful for aggressive decks (unless you think that teching it in might change an Insecticon matchup more than teching in indirect damage), but the usefulness of the green pip make it very interesting in decks like Double Prime or Cars with their very disruptive playstyles. It'll almost definitely see play, especially with how powerful combiners can be -- but don't expect every deck to play it. I, for one, welcome our new Car overlords. In all seriousness, though, I do think that Car Control might make a massive comeback into the metagame with the advent of Cornered! and the Stunticon support. Whereas frail, Cars are untargetable half the time and it makes it very annoying for tall decks especially to try and beat. I am slightly concerned that Cornered! 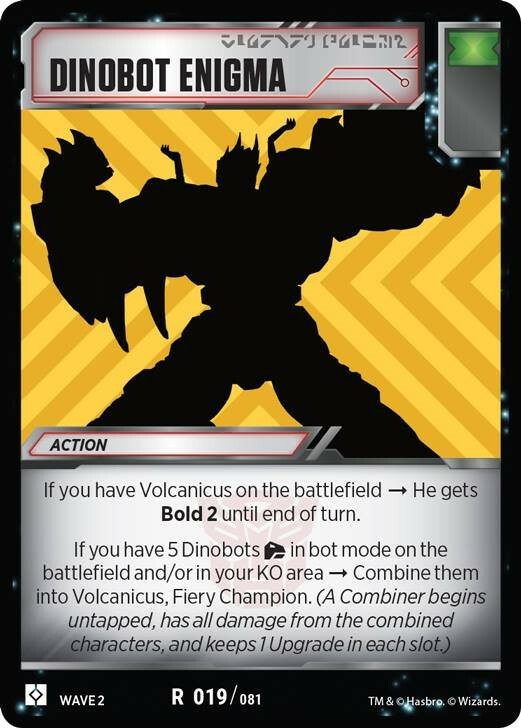 might make Combiners unplayable unless they have a unique way of spamming out parts like Volcanicus can, but that remains to be seen and is really only a knee-jerk reaction I had when reading the card and the developers' intent behind it. But all in all, I think the game is definitely going into a more diverse direction, and that is a very good thing for the metagame. I mean, no one wants to face the same three decks over and over, right? I can definitely see some impressive abilities to try and change up the metagame, especially on the part of the Stunticons. I can't wait to see what they can do with Stunticon Swagger, and I can't wait to see how Menasor will do under pressure. Anyway, that's all for my ramblings. If you'd like to hear more of my ramblings, check out my YouTube channel where I upload content for the Transformers Trading Card game among other things. Thanks for reading, and who do you think will come to the game next? Computron? Victorion? Superion? Bruticus? Let me know in the comments below! Is Menasor the Combiner for you? Let us know in the Energon Pub and stay tuned to Seibertron for all the latest news and reviews! 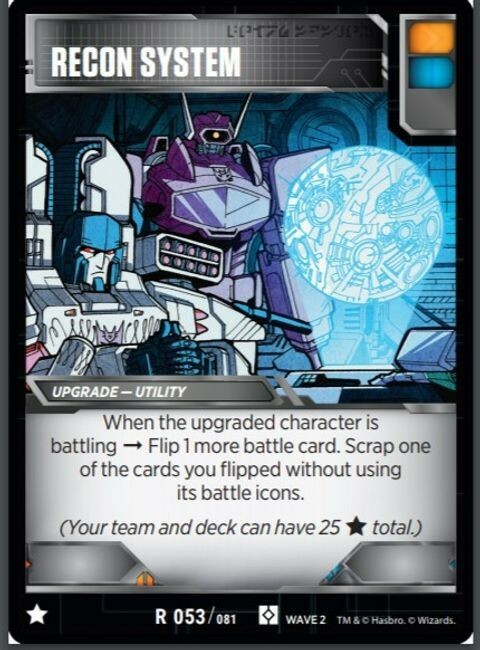 Seibertronians, we have some exciting news for you for the second wave of the Transformers Trading Card Game! This news comes to us courtesy of The Roarbots. Optimus Maximus now joins the fun as the latest Autobot Combiner in the game! Optimus Maximus made his debut during the Combiner Wars toy line and the IDW comics tie-ins. This is a SIX member team, consisting of a special "Gleaming Commander" Optimus Prime, Ironhide, Mirage, Prowl, Sunstreaker, and Hot Rod. Use the "Sentinel Enigma" card to combine them into the heroic Optimus Maximus and turn the tide! These sentinel cards are augmented by the new upgrade card "Combat Commands." We've also got some more support cards incoming, including Scrounge (There is no other like it? ), Secret Dealings, and Smelt. The Dinobots get the new "Electrified Spikes" card and the Predacons likewise get the new "Tooth and Claw" card. Our own Seibertron.com member Sideways has provided us with an extensive review of these new cards to help you plan your deck. Check out his musings along with some nice pictures of the cards in Sideways' review below! Are you hyped for the Transformers Trading Card Game? What strategies are you favoring so far? Let us know in the comments, and as always, stay tuned to Seibertron.com for the latest news on all things Transformers. With that, please, take it away, Sideways! Big Chungus! Biiiiiig Chungus! There has never been a Chungus this big before! With great reveals come great article-bility, and that's where I come in! 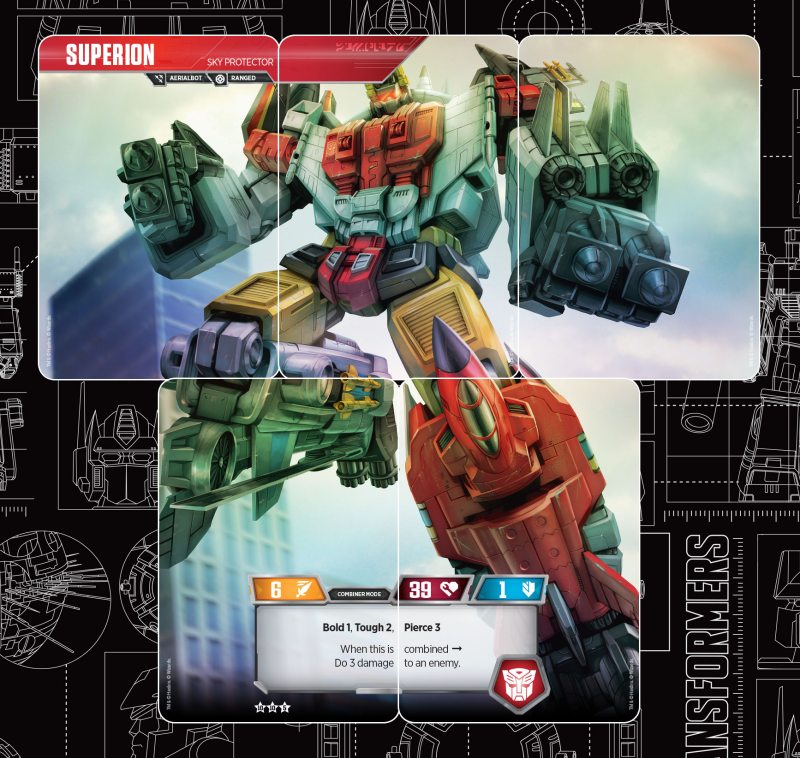 There were a few publications that got to reveal some cards, and one of those reveals was an entire new six-man combiner team! We also get to find out what the heck a "Sentinel" is! Let's dive in! Wow, the new Ultra Magnus card looks great! 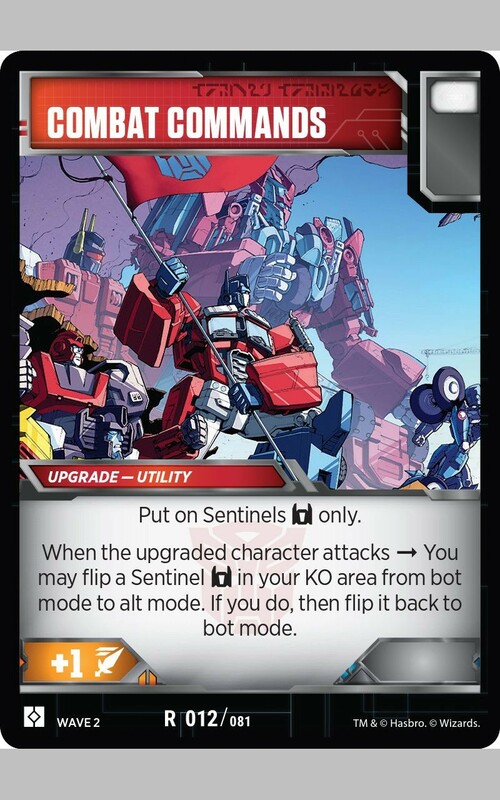 This card is coming out of the exclusive reveal by The Roarbots, where they showed off the entire team of Transformers to make up the Sentinels, the essential "Team Prime" to make up Optimus Maximus. Let's do a quick breakdown of his stats. First off, his health is monstrous for a Combiner piece, and I should hope so given how integral he is to the success of this deck, and his surprisingly competent attack stat can make a good first impression upon attacking with him. He's melee in both modes, which is (at least in my opinion) a good thing, as he can use both Power Sword to pull off his combo and use Body Armor to supplement a middling defensive stat. So, before I get into what he does specifically, I would like to point out that he has 11 points, and is rather sizable for being a Combiner piece. This, you might notice, is roughly half of your point pool, and that doesn't leave too much room for wiggling in five other friends to make up Optimus Maximus. That's where his vehicle mode ability comes in. You place three "Sentinels" into your KO pile at the start of the game, which sounds counterproductive, but when you consider that Combiners combine from the KO pile as well as the field, and that you can choose to transform a KO'd ally for turn, things start making sense. Things make even more sense given the Sentinel's knack for being useful, even when dead, but that's something to be explained later. The real juice that comes out of this Optimus Prime is the robot mode ability, which can put you even further ahead on the Transformation Arms Race that happens when Combiners face off. You see, when you flip one of each pip -- save Green of course -- you get to Transform one of your KO'd characters to its other mode, which not only puts you ahead, but also triggers several other effects on the character cards themselves. But as a final word on Prime, here, you can't live without him in an Optimus Maximus -- OpMax for short -- deck for more than one reason, his vehicle mode ability being the only way you can combine and his extra transformation effects being fantastic to get you to a faster combination. But as for his obviously limited play outside of his own archetype, something fascinating you could play him in is a Volcanicus hybrid list, where you use Optimus' effect to give those Dinobots in the KO pile an extra transformation. Naturally, it'd be a tight list, but I would love to see if it could work. But what about his other Sentinel brethren? I'm surprised Optimus Prime isn't the one in the KO pile to give a boost to him. He's finally here, and he's just as tiny as he was in Megatron's arms when he blew away Prime! He's basically Star-Lord punching Thanos, but thirty years ago. But it's not like I'm upset about something that happened before I was born or anything. Ahem. Anyway, talking about the card itself, I love this guy. I'm not gonna lie, Hot Rod is one of my favorites of the entire group. Having a pocket indirect damage ability is great, especially when you consider he has solid stats that make him great at dealing damage until his inevitable demise. The biggest issue he has is the question of "who do I want dead at the start of a match?" Your whole team is pretty interchangeable in that regard, and really only changes it up depending on certain matchups. The fact that he can help you 2HKO Skrapnel or KO a Force Fielded Six-Gun should definitely not be underestimated as both will likely prove problematic for OpMax, but dealing one damage elsewhere is kind of "meh" in certain regards. Combat Commands makes him really interesting, though, because it turns him into a continuous damage output mechanism from the KO pile no less. He's fascinating, and doing some interesting plays with I STILL FUNCTION! can never be ruled out. Combat Commands is something I'm going to get into later since we now have the composite parts that make up the card's whole, and I admittedly misread it slightly when it was first revealed, but more on that later. As for Hot Rod, he's really interesting for OpMax, but at seven points, there are definitely better Cars to take in other Car lists. Whereas he can still abuse the Car support and untap into infinity, you're still pretty underwhelming when it comes to other, non-Sentinel Cars. He's cool to think about in Cliffjumper, though, but outside of those two ideas I struggle to reconcile him in other lists. Is it me or is Ironhide not the kind of person I would peg as running around with a melee weapon? Regardless, this old coot has the same stats that Hot Rod has and even the same point cost. The only real differences are that he's a Truck, and he has slightly different abilities. The first of which is, instead of Hot Rod's Tough 1, Ironhide has Bold 1 which, in my humble opinion, is better than Tough 1 given the abundance of Bold stacking you can do as opposed to the sparse Tough effects. That being said, there is something to be said for Tough with the advent of Acid Storm's anti-Bold abilities, but his prevalence in the meta remains to be seen. Acid Storm's presence notwithstanding, Ironhide is also, well, an Ironhide, which means he can use Static Laser of Ironhide to its fullest potential. It's an interesting concept that shouldn't be overlooked when considering active partners in a OpMax list. The simple fact that he is a Truck also allows you to play Cargo Trailer and Team Up Tactics, but it is still unknown whether or not the Cargo Trailer stay on the combined form when you do inevitably combine. As for the final ability that Ironhide has, he gives his allies all Pierce 2 when used from the KO pile. I've already made several mentions of my detestation of low Pierce, but in this case, Ironhide combos pretty darn well with the Matrix of Leadership, giving each of your characters Pierce 3 in total. This can combine with The Bigger They Are to put yourself at Pierce 7, and then you're off to the races. Stacking Pierce is pretty okay -- not as good as Bold, of course, but high Pierce can definitely put a hurt on several different archetypes. Again, I am not sure how useful he is outside of OpMax, but it is worth noting that in a Truck based archetype you can use him instead of Starter Prime or perhaps Kup. Trucks -- oddly enough -- have some good potential through use of high Tough and stacking Cargo Trailer, and I can't say it's any worse with the use of Ironhide. Either way, Ironhide is pretty useful in OpMax at least, and I think taking him alive instead of starting off with him dead is probably for the best depending on how you want to build your list, but the interchangeability of the characters in this archetype should never be understated. You can't kill what's already dead. Simply put, Mirage isn't the greatest in terms of offensive or defensive power. In fact, he has very few things about him that stand out. If it weren't for his Specialist ability, I wouldn't like him at all. But let's be fair here -- being a Specialist in a Combiner List, he allows you to use Field Communicator and Multi-Mission Gear to speed up your Combination, which is always a good thing in a format with Cornered! putting a hamper on Combiner hopes and dreams. But simply put, Mirage is pretty dismal when it comes to usefulness as an active character. His robot mode, however, is very useful when KO'd. You can use him to dumpster Insecticons by removing their I STILL FUNCTION!, discard Cornered! so that it can't be used against you, and abuse Dinobots that want to play Dino-Chomp! pretty much ever in their lives. But perhaps the most important thing to note is, against other combiners, you can completely deny them a Combination likely for the rest of the game (depending on the list) by simply discarding their Combination Enigma at the right time. That's why I actually really like this guy in OpMax and a potentially control-based deck, and why I actually kind of like the idea of running him in Cliffjumper-based Car Control lists. The simple fact of the matter is that a pocket Action scrapping effect is really neat. When he's alive, he's mediocre at best, but when he's dead, he can swing entire games in your favor. A funky card to be sure, but a welcome one. "Hey, can you pass me another Capri-Sun?" Sunstreaker is the better cousin of Mirage in almost every sense. He has better base stats, survivability and a generally more useful role as the team's Specialist. Generally, you have access to all the utility that a Specialist can bring to the team, and keeping him in Car mode for the majority of the game is a good idea given his robot mode's utility when he is KO'd. Like it or not, being able to draw a free card is almost never a bad thing. Of course, there really isn't too much else to write home about for Sunstreaker unfortunately. Unlike Mirage, he probably isn't worth putting in the KO pile at the start of a game if for no other reason than to abuse his being a Specialist and his higher stats than Mirage. As with all Cars, he can use Turbo Boosters and Start Your Engines to keep untapped and fighting fit. You can use him in combination with Hot Rod to both keep ahead in the attacking game and to use Swap Missions to keep attacking with Optimus Prime. Of course, Ironhide also should probably be active, but it really is down to your discretion and your list. These guys -- again -- are pretty interchangeable, somewhat mirroring Scramble City combiners of old. But either way, you have access to a lot of things that make his Specialist utility definitely worthwhile to keep in your active list. He also can be used with Cliffjumper to have an extra draw while KO'd, but you don't really want to Transform any KO'd Cars unless you're doing something massive (like using Mirage to discard important Actions). All in all, he's the Specialist you'd have active, but that's more by default than by design. All suspects are guilty until proven innocent. Prowl is another fighting for the title of "currently living", with the highest attack of his peers and Bold 1, he hits the hardest and the fastest out of all of his teammates. The only downside to that is that his robot mode is a bit lackluster considering he's just a Weapon scrapping effect. Weapon scrapping might seem good, but when you consider that Grenade Launcher already discards itself after use, your targets are far more limited than you might think. If you're going to discard an Upgrade at all, make it an Armor. Armor can be overly oppressive between stacking Tough and Force Field, and when you can discard them before you get to attack your opponent's characters, it's pretty great. However, that's not what's happening here. It's a defensive weapon-scrapping effect that unfortunately happens on your turn. The reason that's bad is that when the turn passes over to your opponent, they can simply attach a second weapon to that character and completely negate your effect. Sure, you can use it in tandem with Security Checkpoint, but I would just rather pour my Action resources into something far more useful, like a Rapid Conversion, a Confidence or a Swap Missions. Regardless, at least he does something. He doles out a lot of damage, and having an effect when he does eventually go down is a good thing. Again, if it isn't evident now that these characters are pretty interchangeable, I don't know what to tell you. Outside of OpMax, though, I can't see this guy being played all that much. Maybe in Cliffjumper to make use of his powerful offensive power, but there are a lot of great effects that Cliffjumper can make use of and I'm just not quite sure if you need an offensive car taking up that much of your point pool. Rollin' in the streets, swingin' on the beats. Optimus Maximus is a huge Combiner. 65 HP is a lot to burn through, considering, but when you realize that you're inevitably going to start the game with half that already taken, that number grows smaller by the minute. You see, when you place three characters into the KO pile, all of your characters have 10 HP (save Prime, of course) and that damage carries over to the combined form, leaving him with -- at most -- 35 HP. That's pretty much the same as Metroplex, but there's another caveat: There's no way to immediately combine, so you're going to end up taking at least 15-20 damage spread around your characters just as the game goes on. The simple fact of the matter is this: You're going to have roughly 15-20 HP to play with once you combine, and that's around as much as a solo Nemesis Prime. That's fine, of course, because you're incredibly hard to take down once you do combine. Why? Well, your defensive stats are "meh", but the real juice comes in when you realize you have a Plan effect when you are both attacking and defending. So, not only can you supplement your absolutely monstrous 9 attack to ludicrous numbers, you can also supplement your defensive capabilities to have some tremendous staying power. Whenever you attack there's a good possibility to completely OHKO an opposing character (especially with Mining Pick, which I'll talk about later), and when you defend there's a good chance you can block a good bit of damage. You're also a Leader, but the Matrix of Leadership doesn't really do that much for you other than give you +1 as your team has merged together into a tall character. But nevertheless, there is a good chance we're about to see different Leader support as well. This is all made easier given your honestly extremely speedy rollout. Optimus Prime allows you to transform quickly and get ahead in the ticking time bomb that is a Combiner. OpMax is a simply wonderful combiner that I can definitely see taking a spot in the metagame. My only concern is Menasor. Menasor has a lot of power in his disruptive abilities, moreso than you, and it will really come down to the ol' "who can disrupt the other harder" game. I haven't playtested it, of course, but the two share a similar disruptive playstyle. I ran out of Enigma puns a long time ago. This Enigma is definitely not an Enigma. Most Enigma have a secondary effect that make having multiple in your hand not the worst thing in the world, for instance Predacon Enigma draws a card and plays an Upgrade, but most are somewhat underwhelming like this one. Whereas it does scrap an Armor, it can't scrap any Utilities and that's somewhat disappointing when you consider that Ramming Speed, a card that is barely played in the first place, can do all that the Enigma can do and more. But then again, Sentinel Enigma is an Enigma and you can't really ask it to do anything more than that. No painted rocks here, Indy. "Taking a leap of faith" is the exact opposite of what this card does. This card plays free cards, simply put, and if you happen to flip a card that has an effect you don't like, you can choose not to use it. There is no "oops, that Security Checkpoint just made me discard my hand" or "I didn't actually want to use Peace Through Tyranny" here -- just pure, unadulterated free cards. Of course, drawing into this Star Card isn't going to be easy, but if you have a list with Optimus Prime -- Battlefield Legend, you can use this card extremely easily to play free cards out of your ears. Leap of Faith is just plain nutty, and I love it. I'm gonna be honest, that's a very red card. Field Repair is kinda awful. Its effect of healing a single damage counter is terrible, and whereas Plan 1 is good, it isn't like that's an unheard of effect. There are a ton of good cards that Plan, for instance Incoming Transmission. There really isn't too much to even say about it, let alone combos. Something that is worthy of note though is that its design is discordant with the other designs of Autobot Actions, having the entire text box be red like an Upgrade. Even more than that, it was revealed by my favorite source of spoilers, "some dude on Facebook". Whereas I wouldn't believe that this card was real, the moderators have been very good at taking down spoiled cards that have come out before the cards have been officially revealed and Wizards has been very upfront on communications with the community. Something else that I checked was the Cybertronian script at the top right, and verily, it says Field Repair without a typo in sight. That's right, I legitimately thought it was a fake for the longest time. I was even debated not covering it at all until we had an official statement on the matter. The reveal was very unceremonious, so much so that it bumped my suspicion to the nth degree. I guess you're only paranoid if you're wrong, right? Secret Dealings is a card revealed alongside Scrounge and Smelt by The Roarbots, and it is strictly okay. Think of it like an Action version of Data Pad, which is okay, but when you consider that Incoming Transmission does the same thing but you draw an extra card, it makes me struggle to reconcile this card's existence in a list. You see, the best thing it has going for it is that it's a green/white pip. Incoming Transmission is an Orange, which means that some lists can't -- or don't want to -- play it, but then again most defensive lists don't want to Plan offensively like this card does anyway. But having a green pip is a good thing, and it allows you to have a nice Planning effect. But that's not a good enough reason to take it in a list, methinks. There are just better cards to play during your turn. I hear he has a special arm, that there's no other arm like it. The second reveal by The Roarbots is kind of interesting when you think about it. On the surface, Scrounge seems like a worse New Designs, but when you consider that there are a lot of Plan effects, it becomes a somewhat better New Designs. Put it this way: There are several new characters that Plan upon Transformation, and when you plan an Upgrade, you can use Scrounge to immediately play it, and you can pull off this combo fairly efficiently given the fact that Scrounge sports a green pip as well as an orange one. New Designs also technically takes a card out of your hand when you play it, given that it attaches from your hand, and sometimes you can just roll the dice with Scrounge and see if you get another Upgrade. You also have to have the Upgrade in your hand in the first place with New Designs, and often times you'll find yourself only having one to attach, making New Designs an effectively dead card in your hand. At least with Scrounge, you have the potential to get ahead on the Upgrade Arms Race. Speaking of Scrounge... Too soon? Smelt is actually not bad at all. Being a blue pip, you can use it in the heavily disruptive blue decks like Menasor or Double Prime, and sometimes simply scrapping one Upgrade is enough depending on your opponent's board state. Sometimes, your opponent only has one Upgrade on the field, and other times you just want to hold back their power before they get to set up. They get to choose their Upgrade to scrap, of course, but when their options are limited, it will almost always go in your favor. It's not that bad, to be frank, and the green pip makes it even more solid than it would be otherwise. I would definitely play this card in Double Prime, Tanks or Menasor to be perfectly honest -- I think it's well worth the spot. Megatron plays Fortnite confirmed. Think he did the Default Dance when he shot Prime that time? Mining Pick is one of the most powerful Weapons I have ever seen. I am not lying when I say that this card adds an unbelievable power to a lot of decks, Optimus Maximus included. Think about it. You have Plan 2 on Mining Pick, which you can use to put two orange pips on the top of the deck which gives you +2 just from Mining Pick's effect alone, and when you use Incoming Transmission to place another on the top of your deck, that's another +1. Oh, what's that? You have a Data Pad? Cool, have another +1! And you say that Optimus Maximus adds another to the top of the deck? Nice, have another +1! You add that collective +5 on top of the three orange pips you're going to see (assuming one of the cards you place is white) and you have an astounding +9 attack. Sure, you've dumped a lot of hand resources into that play, but if you're not killing something outright with that something is very wrong. I love this card so much. The amount of power that you get with it is astronomical compared to most other weapons. Grenade Launcher still might be the now and forever king, but Mining Pick might just be the Mordred to this Arthurian tale. This incredibly niche card is revealed by Scott over at VectorSigma.info where he does an in-depth breakdown of this reveal card. Give him a read if you want to his thoughts on this card, but as for my own thoughts, I think this card is extremely niche but honestly incredibly powerful. You might think, "Hey, Sideways, why are you showing me this bad card for balanced lists?" and you would be right -- this card is really bad for balanced lists -- but in solo color lists, this card is the absolute nuts. When you have an all blue list with a character that is about to go down regardless, you can pop Inverted! on them and suddenly swing for absolutely massive damage. Here's an example. You are playing an all-blue Tank list, and Demolisher has 5 damage on him. You're probably going to go down the next turn, even though you have a Blast Shield on him, so you plop down an Inverted and suddenly his mediocre literally zero attack can now flip a potential 8 cards off the top of your deck to do staggering amount of damage out of nowhere. Sure, he's probably going to go down the next turn, but it's a great last-ditch effort card. You can also use it to keep a character alive in an all-orange list, as every orange pip will suddenly be a blue pip. Sure, you're not going to be dealing as much damage (at all) but you almost certainly won't be getting knocked out that next turn. It's just more longevity and that makes me very happy. I love Inverted! and you should to. It won't be in every list -- in fact, it probably won't be in most lists -- but those decks that play it will make definite use of it. "Rip and tear... Rip and tear until it is done." This Upgrade is sorely underwhelming. I have always had a problem, with an Upgrade that plays other Upgrades -- especially singular ones -- because at a point, why not just play the second Upgrade from your hand instead of having to go through Multi-Tool or something similar? This card is even worse than that because it doesn't even add an Upgrade. It simply opens up the possibility of playing another Upgrade if you ever happen to. Predacons are notoriously thin on survivability, so when you attach this, you're not attaching another Weapon to attack with one of your teammates. Sure, you're getting +1 damage, but there are so many better options than that. Perhaps, then, they want you to power up Razorclaw or Rampage with multiple Weapons and leave his teammates by the wayside while you wait for a massive attack. Again, I would simply attach another weapon and attack with another Predacon, but that's beside the point. I don't really know what to think about this card, but I know whatever I rest on, it sadly won't be good. I just can't get behind this card in such a fast metagame. I can actually think of no better Armor other than Force Field to play in Dinobots. This Armor not only has an orange pip, lending itself to Dinobots' Bold playstyle, and it has an effect that wants to flip orange pips which also plays off the all orange playstyle. Sure, the extra one damage isn't that much in the long run, it does help defend against Insecticons as Skrapnel will never attack anyone with one of these equipped. It's not the best card in Dinobots, but I can't see a reason not to play it. It's a really cool card that makes itself right at home in any Dinobot list. There are a great many a playable card in this next wave, and Optimus Maximus is forefront in my mind when it comes to a premier Combiner. His sheer speed and utility make me extremely excited to see where he goes. Speaking of the Sentinels, I admittedly misread Battle Commands to where I saw it ending the combo in your vehicle mode, I see now that it ends the Transformation combo in robot mode and only does so if you were already in robot mode to start with, making the effects of Mirage and Hot Rod even better than they already were. I am ecstatic to see such an interesting combo in this card game and I can't wait to see if OpMax is as good as I think he is. But it's not just all aggro all the time, it seems, as there are plenty of disruptive cards being printed to give disruption-based decks a good boost. Whereas Double Prime is the most obvious of these, I'm sure that Shockwave will enjoy getting a disruption boost as well. 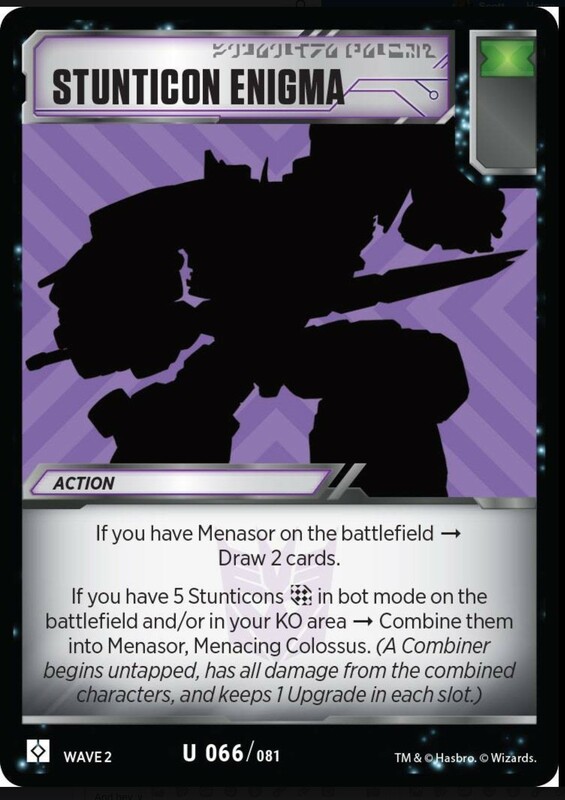 Menasor can also use and abuse several of these new Battle Cards, and that makes me even more excited for the prospects of a combiner being meta. As always, check out MY YOUTUBE where I upload Transformers Trading Card Game content as often as I can. I've been under the weather lately so uploading has been slightly sparse, but as I can finally breathe again I can continue my uploading schedule. All in all, with each reveal my anticipation for Rise of the Combiners grows larger and larger. Thank you very much for reading this titanic article, and let me know in the comments what you are looking forward to the most! How can a card called "Secret Dealings" featuring the Combaticons not feature Swindle? 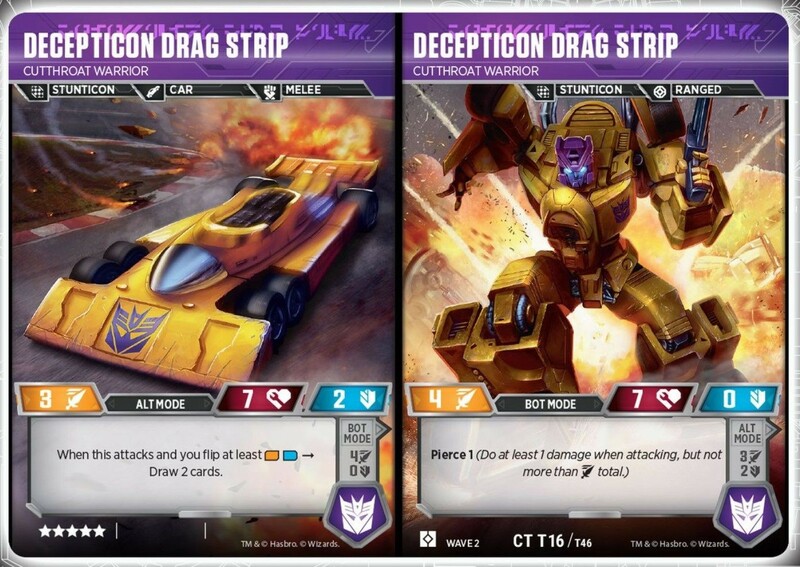 Seibertron member ToxicSmoke has cast our viewfinder over to CBR.com which has unveiled the Transformers Trading Card Game newest card – Warpath! Everyone's favorite loud-mouthed Autobot tank has rolled in. Sporting 2 Attack, 6 Health and 3 Defense in robot mode and 4 Attack, 6 Health and 2 Defense in tank mode, Warpath comes weighing in a 6 stars. CBR also make a point of a new mechanic entering play via a “green battle icon”, where a player can swap out a card in their hand for one of their flipped green cards once per battle. 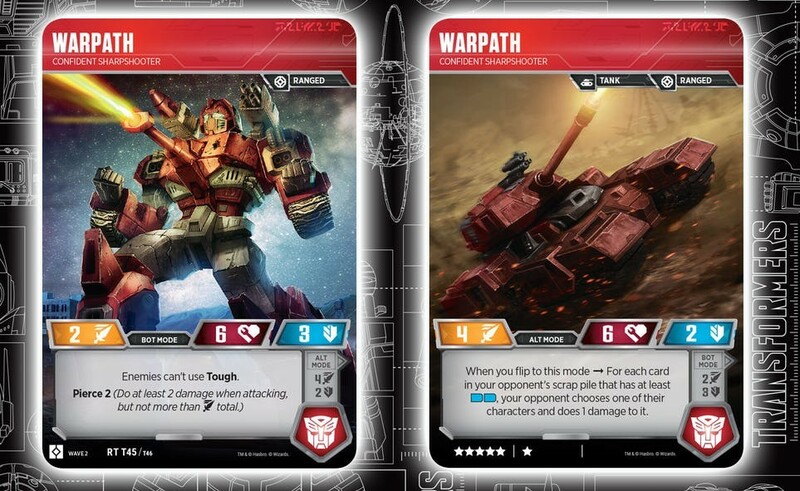 Warpath is set to appear in booster packs from the Combiners booster packs arriving March 1st. We have mirrored the image of the card for your convenience below, but the main article can be read here, on CBR. CBR.com wrote: Fans of the Transformers Trading Card Game will soon have even more options available to play when the Rise of the Combiners booster packs arrive on March 1. 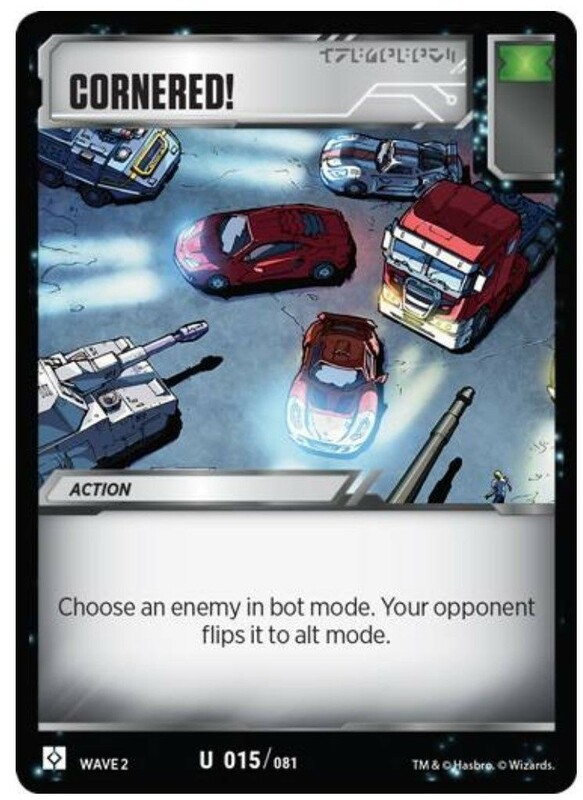 CBR can exclusively reveal one of the upcoming booster packs will feature the Autobot Warpath. Warpath's card pack describes him as a "Confident Sharpshooter" that can transform into a tank. He has an attack level of two, a health level of six and a defense level of three. Another characteristic of Warpath is enemies can't use "Tough" against the Autobot. A new addition to the game is the green battle icon. After a battle is complete, a player can swap out a card in their hand for one of their flipped green cards. However, you're only allowed to swap for one green card each battle. Also, enigma cards are what allow combiner teams to form one Transformer. The only prerequisite is the characters already be in bot mode. Will Warpath be adding some kablowie to your hand or will you be saying “No 'tank you'” to this offering? Let us know here on the Energon Pub here at Seibertron.com! 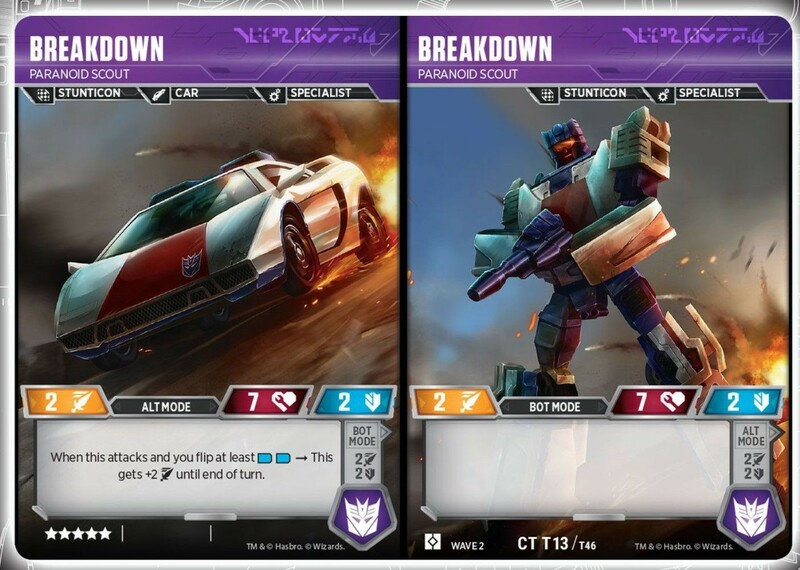 Following the reveal of Warpath to the Official Transformers Trading Card Game, fellow Seibertron user #Sideways# has come forward to share his in depth analysis on Warpath, and on another recently revealed card, Grapple! Hey everyone! 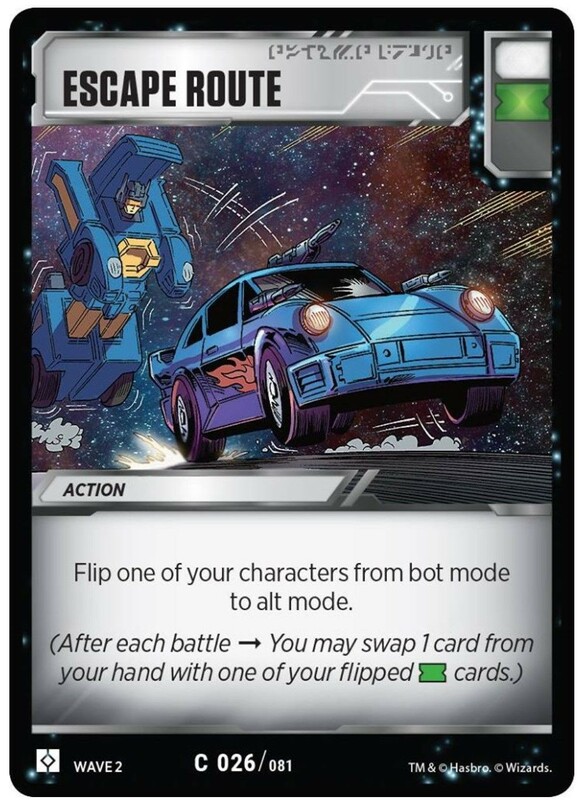 #Sideways# here again with another article going over some new reveals! Warpath was already spotted, but I thought I might share him again to go over what he does, how best to play him and my general thoughts on him! All that and more down below! "Tanks but no Tanks" couldn't be more accurate. Warpath (previously revealed HERE) is another Rare coming out of a set already stacked to the brim with Rares. From Acid Storm, Venin and even the entire Dinobot roster, Rise of the Combiners is pretty well stuffed with Rares and something tells me that there's even more awaiting us in this set. As for Warpath himself, let's start off with the stats. Firstly, we have a modest two defense in his Tank mode and an average four attack. This makes him one of only a few Tanks that actually have two defense, which isn't the best given Tanks' heavy reliance on defensive stats to win the game, with Crushing Treads even working with the defense stat directly. His HP is actually quite abysmal for this reason. I realize that his Robot Mode is going to be his primary mode, but I gotta say, I fear for him on the first turn of the game, especially against decks like Double Prime who would see him as both a juicy target and priority #1 given their reliance on Tough to stay alive. Remember, Battlefield Legend Optimus Prime has a base attack of 8 -- your flips better not whiff if you want to live, and that's not even counting when Prime flips a Leap Into Battle. There's a chance he's going to be targeted down before he can get his usefulness in, but if you manage to keep him alive, you get to take advantage of the second anti-keyword effect we have in the game thus far. Whereas Acid Storm prevents the use of Bold, Warpath prevents the usage of Tough in his Robot Mode. This anti-Tough effect isn't as important as Acid Storm's anti-Bold as Bold is far more pervasive in the meta (especially in the case of Dinobots), but he still has his usefulness against Double Prime, Tanks and other decks that would dare call themselves "overly defensive". This is even more impressive when you consider his Tank mode's effect, which deals up to six(!?) damage if your opponent has all six of their double Blue pipped cards in their Scrap Pile. This isn't going to be the case for the majority of the game, of course, but there is a good chance you'll get three damage or so out of it, which isn't bad at all, especially against hyper-defensive decks. He has a tremendous potential to do some serious damage indirectly -- heck, even plop an Armed Hovercraft on him and spread even more indirect damage to everyone. He can do some serious punishment if the matchup allows. Naturally, if the matchup happens to be overtly offensive, Warpath can only make use of his solid three defense and Pierce 2. He's frankly feeble against largely offensive decks like Insecticons, Predacons or Dinobots. His abilities don't matter in those and similar matchups, leaving everything to his rather average stats to hopefully carry him to victory, which shouldn't be the plan when picking characters for a team. That being said, an interesting combo would be Warpath on a team with Acid Storm so that they might cover the other's weaknesses, both of which making your opponent extremely sad that they decided to play the game that day. Either way, Warpath is a six star character, which makes him always a viable pick if you're concerned about extremely defensive decks in your area. I could definitely see picking him in place of Demolisher in a Tank deck to make use of Warpath's frankly far more useful abilities, but again, Warpath is to defensive decks that a Silver Bullet is to Van Helsing -- great at killing werewolves, for sure, but what happens when you come across a vampire? Silver Bullet cards like Warpath make me glad that we don't have a Sideboard in this card game. Could you imagine the game where in between games you could make a swap or two and whip out a card that completely polarizes the matchup? The whole metagame would fall apart. But then, perhaps that's a good thing. Food for thought. So, in closing, Warpath is someone I'm looking forward to seeing in the metagame. Whether he's with a mixed bag of "hate bears" where your list is nothing but answers to the big decks of the time or perhaps in a Tanks list, I can't wait to see where he goes from here. I don't think he's better than Acid Storm from the sheer number of decks that rely on Bold to do its fair share of damage, but I still think he has potential to be a spicy tech against Double Primes and similar decks. A penny saved is a government oversight. Saving is a theme with Grapple. His entire playstyle revolves around keeping a large hand and dumping it on a massive attack. This is actually a reference to the personal life of one of the developers, as Drew Nolosco -- one of the chief game designers of the TFTCG -- had to save his pennies to purchase a Grapple back in the 80's as one of his first "big" purchases. It's a touching story, but does it translate to value for Grapple? So here's the thing: He requires his entire team to be built around him to have success with his abilities, and for you to save cards in your hand to build up to his Truck mode ability. This would be fine if it weren't so hard to save up cards in your hand in this game. It seems that everyone has some sort of hand-scrapping effect now, and you need to continuously play Upgrades to stay in the game. All that aside, I can think back to Sunstorm and his grindy playstyle and I can't help but to think that Grapple might be a spiritual successor. Questionable viability of saving cards in your hand notwithstanding, his effects if you do pull it off make him quite interesting in terms of offensive and defensive power. You should generally play a mixed list, of course, but with a lot of Green to supplement his defensive ability's trigger effect. Whereas it's easy to power up a character offensively, even Grapple with the Plan and Bold effects making his offensive ability generally pop off most times when boosted by Bold, I can't help but to wonder if that would be the extent of it. But then I am reminded of Evasive Actions and Body Armor and I am relieved -- he can use both of these to not only escape an early grave thanks to his abysmal starting zero defense, but to potentially bolster your hand even further with Green Pips. I don't know whether Grapple will be good enough to be in the meta, though. I see cards like Inferno, whose stats are roughly the same as Grapple and his lack of play and begin to doubt whether or not Grapple will follow suit to his mold-mate. He requires an investment to pull off, but even if you do, would it be worthwhile? Would it really? Or would it not simply be better to play Inferno instead and get the same value for less investment? I tend to lean to the latter, myself, but Grapple's vehicle mode makes me question that assumption with its ability to drop four damage on something. Sure, at the cost of your hand, but hopefully you've set up before you did something so drastic. The thought of using a One Shall Stand on somebody and then plopping four more damage to make a total of seven makes me shudder. But then, that might be a pipe dream -- and besides, wouldn't it just be better to save all of those ever-so important cards in your hand and, you know, use them? Food for thought, but I guess I have always been an offense-centric player myself. All in all, Grapple is fascinating. He would require teammates to draw plenty of cards to supply him with the materials he needs to pop his effects, but I wonder if he's worth the investment, or if he would simply leave us all with a sense of buyer's remorse. 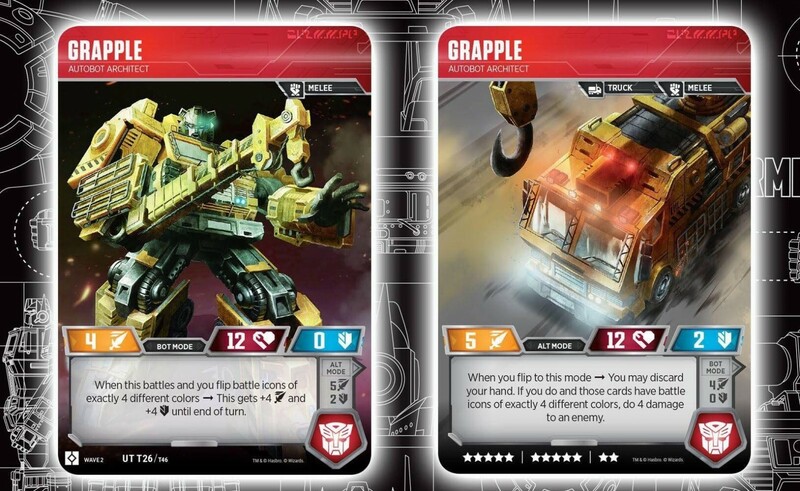 I don't know what to think about some aspects of these guys, but I know one thing, I don't think that this is the last we'll see of Grapple or Warpath. Their existence means someone will try them, and that means one thing: If you happen to be playing defensively at a tournament, you might want to watch your back, and more importantly, your Double Blues. As for me, I will be uploading more thoughts on the second wave of Transformers to my YouTube channel, Nanomachines. If you'd like to check it out, I would greatly appreciate it! What are you liking about these guys? Are you just excited to see more love for Warpath? Or perhaps you're looking forward to breaking the bank with Grapple? Let me know in the comments below! For sure. You can really tell that this game is a labor of love for these developers, that it actually means something to them instead of being some random cash-in. It's always a good thing to see, y'know? We have a plethora of card reveals for you all to mull over today, and all from different sources. Let's dive in shall we! First up is the reveal of Superion joining the ranks of the Autobots in Wave 2: Rise of the Combiners. This comes courtesy of io9.Gizmodo.com. This news was shared with us by fellow Seibertron users, Nathaniel Prime and Nexus Knight. As you can see, Superion follows the trend set by Menasor in using the team rooster as set by their recent toyline appearance in Combiner Wars. 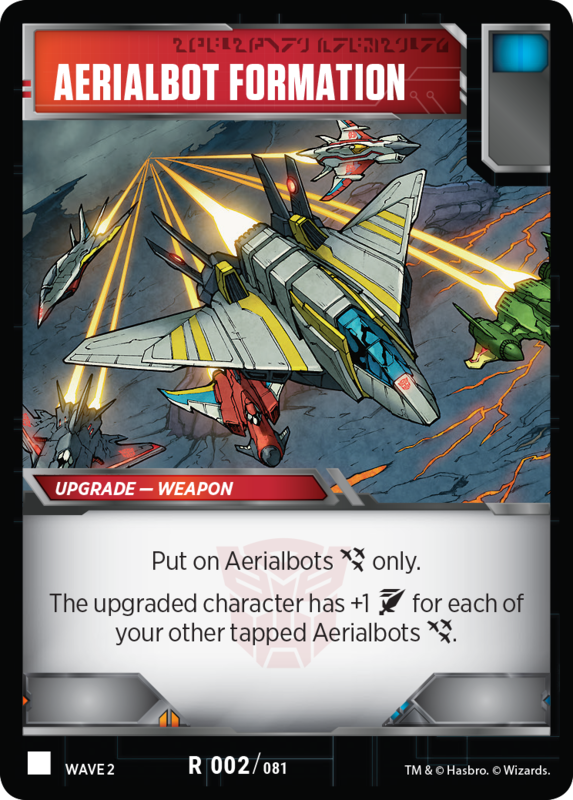 The team also gets a Aerialbot specific card. 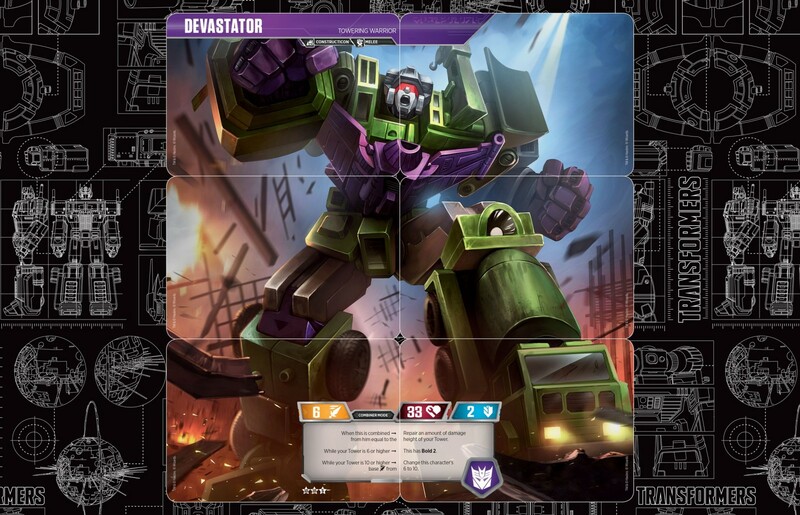 Next up is the reveal of the second theme deck for the game...this time focused on one of the mightiest Decepticon Combiners of all... Devastator! This comes courtesy of Kotaku, and we were pointed in the right direction by fellow Seibertron user and podcast host, ScottyP! Devastator will be released in a separate Rise of the Combiners deck on March 29th, the same way Metroplex was last October. Like all other Combiners so far, these also come with an Enigma. What do you think about these reveals? Will you be hunting down any of these Combiners for your deck? Let us know in the Energon Pub and stay tuned to Seibertron for all the latest news and reviews! 4,603 pages were recently viewed by 751 unique visitors. This page was viewed 1 times on Friday, April 19th 2019 7:37am CDT. © 2019 Seibertron, Inc. DBA Seibertron.com. All Rights Reserved. Established June 2000. Seibertron.com is owned by Ryan Yzquierdo.